Matt Kemp was an atrocious center fielder. There’s really no way around that. Of the 60 center fielders with at least 6,000 innings played since 2002, only the decline years of Ken Griffey, Jr. and Bernie Williams show up as being worse. His 2010 is the single worst DRS ranking of any player season we have on record dating back to 2008. We generally use Rafael Palmeiro’s 1999 Gold Glove in a season where he played only 28 games in the field as the paragon of atrocious award choices, but it could have just as easily been Kemp winning not one but two such awards. That was true before the endless run of injuries — notably multiple hamstring pulls, a severely injured ankle and a badly damaged shoulder — that sidetracked his career, and it’s even more true now. At 30, with years of injuries behind him and speed that isn’t what it once was, Kemp can no longer outrun his mistakes and questionable instincts in center. You know that. We know that. The Dodgers know that, having forced him out of center in the middle of a May road trip when the immediate alternatives were no better than Andre Ethier and Scott Van Slyke. Kemp himself might not know that, having made noises he wanted to return to center, but Jeff did a wonderful job here back in July explaining just why that was such a bad idea. 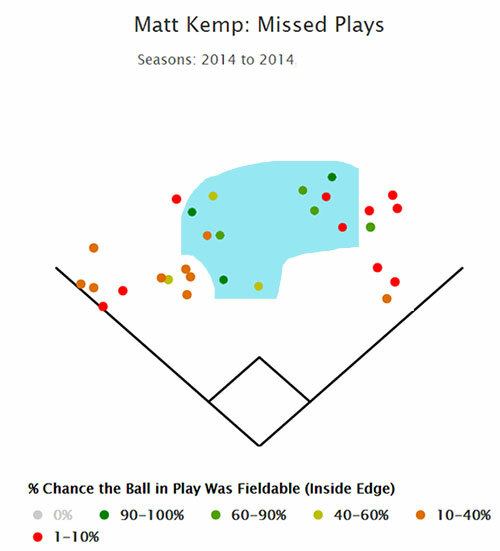 Whether or not the Dodgers trade him or hang on to him, it seems all but certain that Kemp will never be a regular center fielder again. Now Kemp is a corner outfielder, and that’s opened up some new questions, issues that are particularly relevant as the Dodgers field endless trade discussions this winter. They have to weigh the positive and negatives between the facts that he’s still owed $107 million, that the team has a well-known outfield glut, that Hanley Ramirez has taken part of the Dodger offense with him to Boston, that second-half adjustments made him one of the best hitters in the game down the stretch… and that by the metrics, he’s not seen as being a good corner outfielder, either. That’s an important distinction, because as teams try to figure out how much to weight his hot second half and year of full health against his future projections, what he can offer on defense plays a big part in that. There’s a big reason that his very good 140 wRC+ in 2014 led to only a 1.8 WAR, because it was weighed down by 1,195 innings of awful defense. Now we have a question to attack — how much of Kemp’s awful rating was because of his time in center, a position he’ll never play? How much of his lousy rating in the corners can we rely on because of sample size? Is he just a DH with a glove, or is he worse because teams will actually let him play the outfield rather than forcing him to DH? Let’s stipulate two things. One, yes, I am a Dodger fan, so feel free to incorporate any amount of bias you see, although note that I’m immediately saying two, I have no expectation that he can be a plus or even good corner outfielder. The question before us is whether he’s “cover your eyes awful” in the corners as he was in center, or just “we can deal with this as long as he hits.” It’s the difference (assuming the rebirth of his bat was somewhat for real) between a league-average player or a star-level player, and that matters on the order of tens of millions of dollars. A league average player is a nice guy to have. It’s not $107 million over five years nice. 1) Half a season in the corners in 2014 is a limited sample. The year to year fluctuations in defensive metrics are due to the fact that players are getting graded on how they do in ~50 plays per year, the number of chances they get that are neither routine nor impossible. In any kind of sample of that size, small fluctuations can lead to a big difference; we see the same thing in small samples of offensive metrics, for instance. A few things should stand out to you there. One, his hideous play in center field is easy enough to see when you notice just how many green and dark green — i.e., balls a huge majority of center fielders would get to — fell in. (As though the team removing him so Van Slyke could play center instead wasn’t enough of a clue.) That’s magnified when you realize that was just 326 innings there, it was the position he played the least of this year. Two, while it wasn’t quite so bad in left, there were still more than a few balls that a lot of other outfielders would have had, and remember, he started only 44 games there. But it’s really right field that intrigues me, because you’ve got the one fielding error (green), five balls that would have taken a very good play to get to (red, one of which was a Ryan Braun home run), and one difficult play (orange). Remember, we’re not looking for excellence here. We’re looking for competence, and for the position he played the most of (500.1 innings), there’s not a lot of miscues there. And yet: the metrics hated him anyway, giving him a -3 DRS and -8.8 UZR/150. It’s nothing compared to his -12 DRS (!) and -33.8 UZR/150 (!!) in center — I cannot emphasize enough how bad of a center fielder he was — but it’s not great either, and it does seem to be in part because of a sample issue. The first two were poor breaks on balls that forced him to come in, which has long been an issue. The third, a crushed Anthony Rizzo shot to the track that probably required a longer run than it looks given that he was shifted towards the right field line. 2) We’ve seen him in the corners before, it wasn’t great, and defense peaks early. …right. Kemp came up as a corner outfielder, back in the days when the Dodgers were fooling around with Juan Pierre and Andruw Jones in center. In 2007-08, he played more than 1,000 innings in right field, and he wasn’t graded very well back then, either. We’re not talking Brad Hawpe bad, but of the 29 right fielders with 1,000 innings over those two years, he ranked 16th (DRS), 19th (Defense), and 22nd (UZR/150). His issues then were the same as they are now, in that poor instincts and range (-9.2 RngR, 22nd, ahead of mostly much older players like Bobby Abreu, Griffey, Jermaine Dye and Vladimir Guerrero) hurt him more than a strong throwing arm and relatively sure hands helped. Of course, 2007-08 were his age-22 and -23 seasons. That was a long time ago, before his leg injuries, and defense tends to peak early. Like you, I cast a wary eye on the accuracy of defensive stats from six and seven years ago, but we also can’t ignore that the reasons why he graded out poorly are the same reasons we still see today. …which I’m doing because I wonder how much of the negative perception of Kemp’s defense comes from years of ineptitude in center. Not that the numbers care about our perception, but people aren’t only looking at the numbers, either. As usual, a lot of this is guess work. DRS thinks he is/was a scratch outfielder in right, and UZR thinks he’s slightly below average. Maybe, in 2015, he’s an acceptable outfielder. But there’s little to indicate he’s going to be the guy who is immune to the passage of time, and that there’s still five years left on this deal requires that whichever team ends up with him deal with what he is in 2020, too. Really, while he can’t possibly be as bad in the corners as he was in center, that alone isn’t good enough, because there’s a nine-run positional adjustment between the two spots. If, as Dan Szymborski noted on Twitter yesterday, Kemp increases to a mere -10 runs in right with his projected Steamer offense, that’s about a two win player — and improving to -10 runs from how awful he’d been in center would be a considerable improvement. It’s less about how he’d improve a team in a corner so much as it would be how much easier he could be hidden in a corner. This could all change based on where he ends up, as well, particularly because Seattle and San Diego have been noted as the two teams most interested, and neither plays in small parks. (Yes, Seattle has the DH. They also have Nelson Cruz.) If he’s still in Los Angeles and playing next to the rangy Yasiel Puig and Joc Pederson in some configuration, perhaps that helps hide his woes. Ultimately, the problem here is that this situation seems like it’s only going to go downhill, as well as the fact that he should have never been asked to play center in the first place. From what we’ve seen, it’s premature to say that given a full year of data and health in a corner, Kemp couldn’t be at least adequate as relates to the offense he provides, because he’s still got that arm and being slower isn’t the same as being slow. But he’ll keep aging, and what might be acceptable for another year or maybe two seems like a huge issue down the road. He’s not a DH yet. Soon, though. Soon. We hoped you liked reading On Matt Kemp’s Defense by Mike Petriello! How Will Jon Lester Age? Saying Kemp is a scratch defender is the most cromulent thing I’ve read today. You will note that I said multiple times how poor I believe he is. Unfortunately, he has unable to embiggen the Center Field position with his un-cromulent performance. Maybe he’ll do better outside of LA with a manager that shaves those sideburns.